Definition: Dysarthria is a motor speech disorder that is a condition in which the muscles people use for speech are weak or they have difficulty controlling them. Dysarthria often is characterized by slurred or slow speech that can be difficult to understand. Dysarthria can happen with other speech and language problems. People might have trouble getting messages from their brain to their muscles to make them move, called apraxia. People could also have trouble understanding what others say or telling others about their thoughts, called aphasia. Neurological injury due to damage in the central or peripheral nervous system may result in weakness, paralysis, or a lack of coordination of the motor-speech system, producing dysarthria. These effects, in turn, hinder control over the tongue, throat, lips or lungs; for example, swallowing problems (dysphagia) are also often present in those with dysarthria. Common causes of dysarthria include nervous systems (neurological) disorders such as stroke, brain injury, brain tumors, and conditions that cause facial paralysis or tongue or throat muscle weakness. 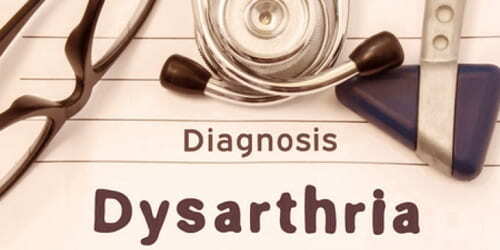 Certain medications also can cause dysarthria. In timing, because they take too much time in speaking. People with dysarthria can’t control their speech, vocal quality doesn’t seem good. They can’t even control the pitch and volume of their voice. People with dysarthria can’t control the breath while speaking; as a result, they can’t complete sentences or words as generally needed in normal verbal communication. They can’t apply the necessary strength while speaking. Dysarthria treatment is directed at treating the underlying cause of people’s condition when possible, which may improve their speech. People may have speech therapy to help improve speech. For dysarthria caused by prescription medications, changing or discontinuing the medications may help. 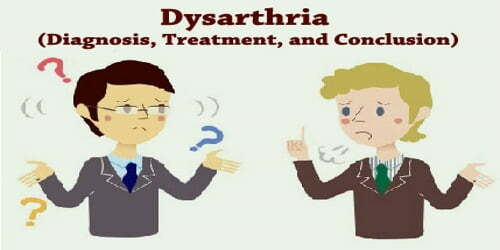 Diagnosis and Treatment of Dysarthria: Dysarthrias are classified in multiple ways based on the presentation of symptoms. Specific dysarthrias include spastic, flaccid, ataxic, unilateral upper motor neuron, hyperkinetic and hypokinetic, and the mixed dysarthrias. A speech therapist, an expert in speech-language testing normally evaluates the speech of the patient to determine the type of dysarthria he or she has. After getting a report from the pathologist, the neurologist treating the patient takes the necessary steps to start related treatment. The patient’s treatment will depend on the cause and severity of their symptoms and the type of dysarthria they have. The doctor will treat the cause of the patient’s dysarthria when possible, which may improve their speech. Providing training to the caregivers, family members, and teacher’s to better communicate with the patient. Augmentative and alternative communication (AAC) devices that make coping with a dysarthria easier include speech synthesis and text-based telephones. These allow people who are unintelligible or may be in the later stages of a progressive illness, to continue to be able to communicate without the need for fully intelligible speech. Conclusion: Dysarthria impairs the capacity to speak sporadically. It’s a neurological disorder that leads to reduced muscular activities in and around the face. Dysarthria may happen due to many reasons including injury to the brain and side-effects of some medicines. Upgraded diagnostic systems and pathological testing help the doctors to pinpoint the causes and source of the disease in an individual. Some forms of dysarthria due to some debilitating diseases like ALS or Parkinson’s are not reversible, while in many other situations timely treatment may cure the symptoms in due course.